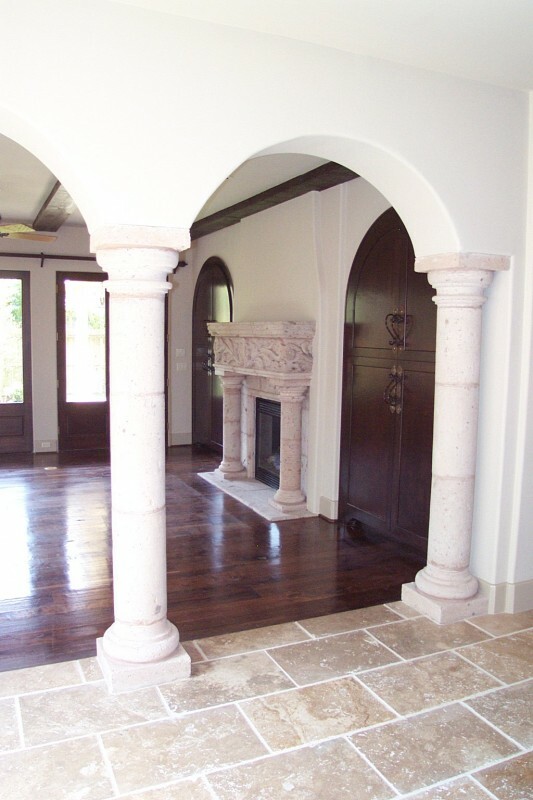 2003 Bellaire TX showcase home custom pillars, arches, hand-carved mantle. 2003 Bellaire showcase home with custom walnut wide-plank wood floors, Italian limestone, and a hand-carved fireplace mantle. Every Watermark Home is a work of art – a masterpiece of architecture and design. Featured here in this stunning image are wide-plank walnut hardwood floors, Italian limestone columns and a hand-carved fireplace mantle. Gary Lee at Watermark Builders has worked with many of his customers to import custom pieces, architectural pieces, building remains from all over the world to incorporate into their dream home. When Watermark Builders brings over a piece of heritage, a piece of history, a slice of time found in Roman columns or a Kitchen Hearth from France, or reclaimed wood from old ships, and integrates it seamlessly into the look and feel and heart of your design – that’s when a house becomes a home. That’s when generations of goodwill and prosperity cross over from something old into something new giving you a rare and unique home to last a lifetime. This entry was posted in Gallery and tagged 2003, fireplace, showcase home by Watermark. Bookmark the permalink.